At Empower, we believe that seeing the whole picture of your money enables you to make the best decisions. And so far, we’ve been successful in providing that transparency for your day-to-day money: your checking, savings and credit card accounts. Once everything is in one place, we are able to analyze your spending and provide tips to save serious bucks on unwanted subscriptions, and offer on-the-go financial coaching to help you manage your debt and spending. When contemplating the next iteration of Empower, we turned to our users and heard a resounding interest in incorporating investment portfolios. While traditionally reserved for the financially privileged, investing has been made affordable by micro-investing apps such as Acorns and Stash. We soon realized the natural next step was to overlay investment portfolios onto the Empower platform to really give users a 360-degree view of their personal finances. And not just USD investments. Empower 2.0 will also include the most popular crypto exchanges: Coinbase, Binance, Kraken, and Bittrex. You may be asking yourself — Why crypto?Whether you’re a crypto fan or foe, there’s no denying the future of your money will most likely include cryptocurrencies. In 2017 alone, there were 20 million new crypto investors who put their good faith in cryptocurrencies to grow their future nest eggs. As a result of crypto’s popularity and backed by user demand, we decided it only serves our users’ best interests if we incorporated various crypto exchanges into the Empower 2.0 platform. Empower Crypto allows you to directly connect all your favorite exchanges, including Coinbase, Binance, Kraken, and Bittrex, to the Empower platform and instantly auto-sync for new updates. You will never have to add a manual transaction, again. Our engineers kept with Empower’s sleek design to showcase your crypto worth at all times. You can see accurate returns and track performance right from your pocket. 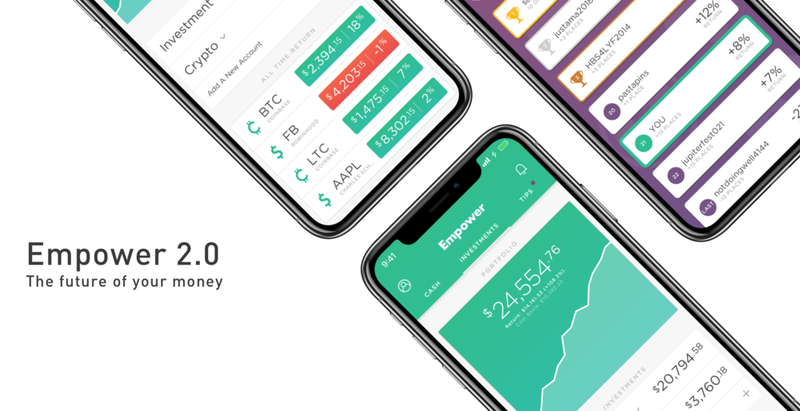 Empower is the only personal finance app that allows users to track their crypto holdings in real-time alongside checking, savings, and credit card accounts, all for free. When asking ourselves what support our users need venturing into the great unknown of cryptocurrencies, not only do we see the need for a mobile crypto tracker, we also see a lack of a simple and honest educational resource. So we went a step further and provided comprehensive background information on the top 100 coins, including their whitepapers, Github and website, alongside a digestible and thorough section we like to call — What [the coin] is? We believe that before you start investing in cryptocurrencies, you should have an unbiased and educational perspective of what you’re actually investing in. You wouldn’t buy stock from a company you weren’t familiar with so why would you invest in a coin you didn’t know. A few years ago, cryptocurrencies were synonymous with the underground banking system where shady traders sat behind computers and bought illicit things. Fast forward a few years later, and that narrative has completely changed. Today, people are using crypto alongside traditional assets to fuel their retirement plans and investment portfolios. One of the main reasons why crypto is so popular is because the coins allow direct payments from one party to another without a third-party financial institution like a bank. Cryptocurrencies are self-governed by the investor community, and similarly to stocks, the value of the coin varies alongside market volatility and various other factors like the utility and supply of the coin. As with any investment, understanding the full picture of your crypto investments is essential to smart saving and planning for future milestones. Who knows, one day you may even buy your first home with Bitcoin! It is certainly an exciting time to learn about cryptocurrencies with so many coins on the market and companies building supportive communities through initial coin offers (ICOs). I encourage you to read about a few coins you’re interested in and ask an Empower coach any questions you may have before you start connecting your exchanges or investing in crypto.